This site is new, so ask some questions, then we can build a FAQ page. Click the contact tab above, fill out the contact form and click submit. 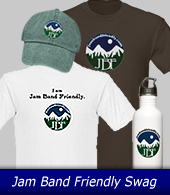 Thanks for visiting the jambandfriendly.com!